It’s become such a widely-used phrase that it’s even transcended into the secular lexicon: God only gives us what we can handle. Yet, within the meaning of that phrase, that belief – which suggests that we are somehow preordained for a heroic role – the individual plight is lost. And, without delving into theology or questioning one’s spiritual beliefs, I’ve witnessed a much different perspective to facing adversity: We only handle that which we choose to handle. See, within adversity, there’s always a specific choice – that is, to rise as the Phoenix or to crumble as a house of cards. And, yes, we all have the capacity for both, where in moments we can teeter in-between. However, ultimately, we rise or crumble, where the will and choice is ours. I’ve seen plenty crumble, choosing not to fight, not to implement free will in the face of adversity. I’ve seen those who have given up the moment that times get tough in health, relationships, careers. But, I’ve never witnessed anyone who wasn’t ultimately equipped to face adversity. It’s as they say in any rehabilitation program, You have the tools. It’s your choice whether to use them. For those of us who face adversity on a daily basis – and rise – we learn to dance with it gracefully. Yes, there are routinely challenging moments. However, instead of being discouraged by them, we move through them, then release them. Again, it’s a choice that we have, to go into adversity, succeed in spite of it, then release it, letting it go. And, that’s when we rise. Now, there are those who are very humble in their plights of choosing to address adversity, not running from it, noting, for example, “I’m the parent of a special needs child. Being there however needed is what parents simply do. It’s just right.” However, unfortunately, that parental mindset is not a given. Lot’s of parents choose not to be parents after all. From one parent choosing to exit the picture, to special needs children as among the highest at-risk groups for foster care, not all parents choose to face adversity. Among the most painful experiences of my life was several years ago when I visited a live-in care facility for special needs children. I was struck by how active and engaged the children were, perplexed why they we’re there and not living at home? “Most of the children’s parents here are quite affluent, and the child’s special needs don’t fit their lifestyle,” the director told me. Not all parents do what’s right. Some choose not to embrace adversity with their children, but choose to shun it. Therefore, those parents who choose to embrace adversity with their children cannot be taken for granted – their choice is among the most noble in humanity. Within all of this, then, is the key to adversity. If we choose to crumble, life stops and joy dissolves. However, if we choose with tenacity to face adversity, move through it, then release it, we will rise. 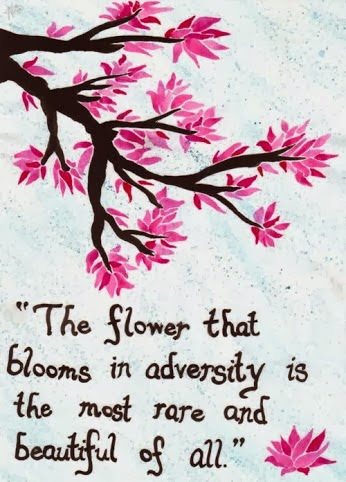 Adversity isn’t a choice, but facing it is. And, the fact is this: we’re all equipped to face adversity, and when we do, we rise. Mark, whenever I take the time to read your blog I am always impressed by how well you approach your subjects. Another well done essay which needs to be shared.